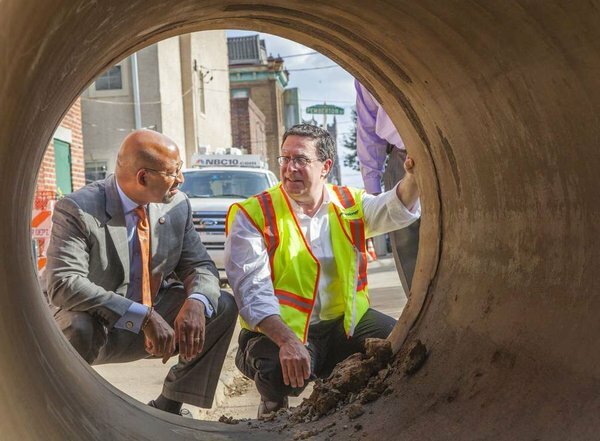 It was a welcome sight to see a feature article about our city’s water infrastructure in Philadelphia Magazine. Normally focusing on the city’s cultural offerings, best restaurants, and nightlife, the magazine highlighted how a particularly frigid winter has caused a rash of water main breaks. Philadelphia is averaging 750 water main breaks a year. While that may seem like a lot, the numbers can jump even higher, depending largely on the weather. And, it is in-line with what older urban American cities are facing everywhere. Like my colleagues across the country, Philadelphia is investing hundreds of millions of dollars in our water infrastructure every year. In fact, our 6-year capital improvement program (CIP) includes a $264 million investment just for the replacement of old water pipes. And while this represents a 25% increase in spending for water pipes (to replace 1% of our pipe system each year), these monies must compete with other needs for replacement and renewal throughout our water and wastewater treatment systems including sewer piping, pump stations, reservoirs, and more. The thing that’s exciting though, is that we are investing in new ways, in ways that maximize value for our customers. In everything we do, we are constantly looking for ways to keep costs down, improve service levels to our customers and sustain our environment and economy. For example, we’re implementing large scale stormwater projects that reduce the impact on our sewer systems while greening our neighborhoods. And we’re doing this with private sector partners to help our public dollars stretch even farther. We’re also redefining what it means to be a wastewater agency—with a goal for all of our wastewater treatment plants to be net zero energy consumption. Yes, our water infrastructure is aging. And yes, we will need to invest billions over the next several decades. But water managers are doing it with an eye towards maximizing value of our customers and building an industry of the future.